There’s something about a band like Iron Chic that makes you convinced that they’ll be around forever, the forever young punk spirit that only seems to get better with age. But with this band in particular, it’s been made clear that this won’t last forever, with the death of founding guitarist Rob McAllister in early 2016 underlining a sobering reality about how finite these bands really are. Especially considering Iron Chic’s previous focus on such heavy topics as grief, life, death and its grander meaning, You Can’t Stay Here sees that fully transition to text rather than merely looming subject matter. And yet, despite how much palpable sadness may underscore this album, You Can’t Stay Here is Iron Chic in triumphant form once again, the sort of album that makes it feelings clear, but is always backed by a feeling of hopefulness and resilience that only the best modern punk bands can capture so doggedly. For as open and overt as discussions of mortality and the band’s own coping are on tracks like My Best Friend (Is A Nihilist) and especially To Shreds, You Say?, the determination is still there, and it culminates in Iron Chic picking up the pieces for a particularly fine punk album. And the thing is, You Can’t Stay Here might eschew any real bells and whistles in traditional punk fashion (save for a few piano lines splashed in here and there), but this benefits them more than most. After all, if this really is Iron Chic laying themselves bare, what better way to accentuate that by favouring instrumentation that does exactly the same? And make no mistake, this is as rousing and determined as it comes, whether that’s in the driving, passionate alt-rock of Thunderbolts!, the daintier, more spacious guitar line of Let’s. Get. Dangerous., and just all of Ruinous Calamity, erupting from humble, acoustic beginnings to the sort of dense, tense alt-rock piled with gang vocals that will never not be a monumental draw. Tied together with Jason Lubrano’s whiskey-drenched vocals and a slew of backing contributors to make it sound even bigger, You Can’t Stay Here is the sort of anthemic punk of a pedigree that most bands should aspire to reach, not exactly pushing boundaries put overflowing with heart and damaged soul that can’t be overlooked. Sure, Iron Chic mightn’t have the greatest musical breadth in the world, which does lead to one or two weaker cuts here becoming lost in the shuffle (Invisible Ink particularly falls below the waterline as a more forgettable inclusion here), but when everything is ultimately averaged out, this is one of the best punk albums this side of The Menzingers’ After The Party. It’s incisive, it’s got buckets of heart, and witnesses a band bounce back from the edge of the abyss in with true gusto and verve. Particularly for punk fans, this isn’t an album to be ignored; You Can’t Stay Here ticks all the necessary boxes and then some to rightfully earn a place amongst 2017’s greats. 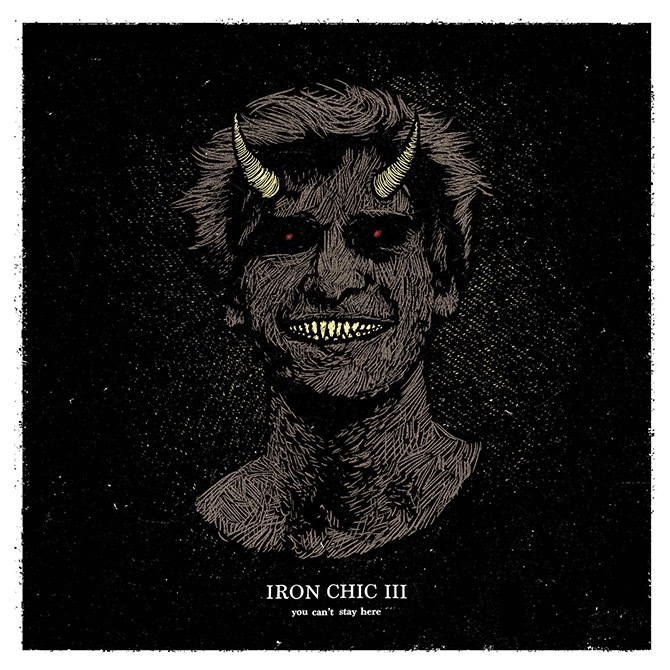 ‘You Can’t Stay Here’ by Iron Chic is released on 13th October on SideOneDummy Records. Nice review, but I have to disagree with you re: Invisible Ink; I feel it has so many layers of guitar sounds, and the song changes moods throughout, making it one of the more dynamic tracks on the album.